Amy Jordan lives in the Hollywood Hills and used to be a high-powered entertainment marketing big shot. She started a Pilates hobby in 2006, and by 2008, she officially traded her business attire for stretchy pants to run two Pilates studios of her own. In 2012, WundaBar Pilates opened doors using her own patented equipment and now has six Southern California locations— from LA to San Diego. 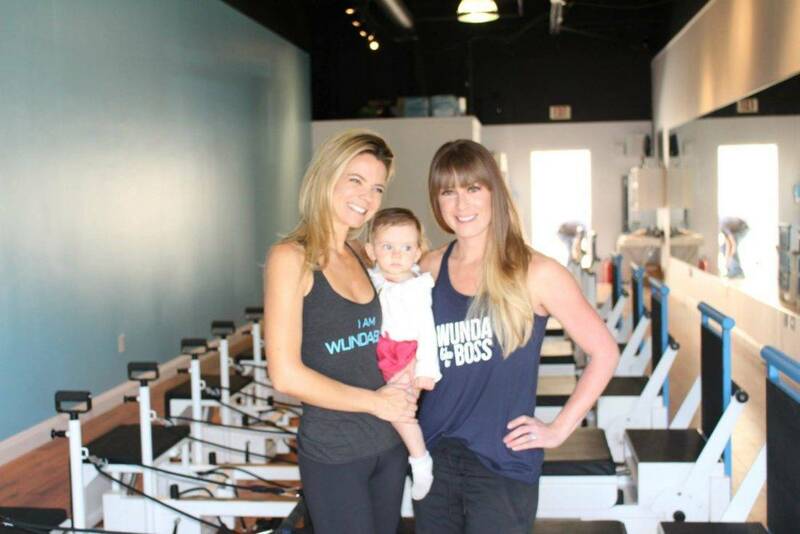 Amy and her husband have two children, and she never stopped her Pilates practice during her pregnancies. In fact, Amy loves working with other pregnant moms at WundaBar Pilates. Because she covers so much ground in the Los Angeles area with her studios, Amy knows many hidden gems beyond the tourist areas for visiting families to try and experience the real LA. Amy works with many of LA’s finest figures. What are your favorite children’s clothing and toy stores? It Takes A Village in Montrose, CA. Unique, high quality pieces— from kimono-inspired onesies to graphic tees— and great accessories like watches and backpacks. The owner, Gigi, is always there and has helped me style my kids since they were born. In Sherman Oaks, Tough Cookies is also great. Please name your favorite stand by for a nice, sit-down meal if you had a squirmy toddler with you. Pace is Laurel Canyon’s “it” destination for locals and Angelinos. It’s been there forever, and—even though it’s a beautiful Italian restaurant—they welcome the kiddos—but the early dinner hours are best to bring them. Also I love Iroha Sushi (no website) on Ventura Boulevard, it’s lively and some of the best sushi in LA. Kids are welcomed and given chopstick “cheats” and mochi with a smile. Please list any other local places that you would take out-of-town friends for some tasty treats. Buttercelli Bakeshop in Sherman Oaks has awesome vegan, gluten-free, and paleo choices for those with special diets and free coffee. Their website claims, “we never flinch when we see a double-wide stroller heading our way.” In Montrose, Gio’s Baguettes has lovely pastries and sandwiches and is close to Honolulu Avenue, a perfect street to stroll with your baby and window shop. Big Sugar Bakery on Ventura Boulevard in Studio City has amazing cupcakes with some gluten-free options, too. What are the local family attractions you take your children to that you enjoy most and why? Disneyland, enough said. Franklin Canyon Reservoir (between Beverly Hills and the San Fernando Valley) has a secret lake and is a perfect picnic spot to stroll, though it can be tricky to find. Descanso Gardens near Pasadena is the botanical garden for Los Angeles County. The gardens are stunning, and there is a small train the families can ride through part of the grounds. Another good spot for toddler train lovers is Travel Town. If you go to the LA Zoo, go first thing during the week and leave by 1pm to avoid massive crowds. A Runyon Canyon hike is wonderful if you have a baby carrier. In LA we also have incredible farmer’s markets every day, and my son will happily go to any of them for an organic apple and tickets to the bounce house. A Runyon Canyon hike’s reward. Where would you take your fantasy family stay-cation? The Pavilion Hotel in Avalon on Catalina Island, about a sixty minute ferry ride away from Long Beach. We go every summer to join our dear friends’ family reunion – over 170 of us! It’s a charming hotel right on the boardwalk with an outdoor, grassy play area for kids and a happy hour by the firepit in the evenings. We have booked our room for next year already. For the adults only stay-cation? In Palm Springs we love L’Horizon Hotel— it’s where we got married, a charming 22 room hideaway with no kids allowed. Gorgeous mid-century modern design, refurbished from the glory days of Palm Springs in the 1950s—so serene and peaceful. You can rent their “residence,” a 3-bedroom house with its own pool. My friend just went to San Ysidro Ranch for her anniversary. I will wish for my very own stay-cation there where you stay in individual cottages for the ultimate in privacy. The cottages look spectacular, and you get to be out on your patio year round because they heat the ground—the GROUND! That’s music to my ears. I am an LA gal who thinks anything below 70 degrees requires a scarf and leg warmers. What is your best piece of advice for flying with babies or kids? Don’t do it! I bring lots of small toys, do a lot of walking the aisles and breastfeed to help the baby’s ears for lift-off and landing. My friend just recommended a roll of painter’s tape to make “art” on the tray and easily remove it after. My son loves stickers, so I think that’s brilliant!